Escape the weekend crowd and noise of Bangalore and spend the night at a riverside campsite at Manchanbele. As the evening falls, you'll gather around a crackling bonfire with your fellow campers and enjoy the night. After a delicious dinner and a night of fun with your group of friends, you'll sleep inside alpine tents pitched at the campsite. The next day, you'll enjoy paddling your kayaks over a nearby lake during a fun session of kayaking. This camping and kayaking trip to Manchanbele is perfect for travellers looking for an off-beat holiday on the weekend. Manchanbele is a small village in Magadi taluka in Ramanagara, about 40 kms from Bangalore city. The village is known for a small water reservoir that serves water to a nearby town and is also a popular spot for kayaking or swimming. It is an ideal weekend getaway in the outskirts of the city, and is great for those looking for a nature escape and an overnight holiday with your friends or family. • Stay in tents at a picturesque campsite at Manchanbele. • Try your hand at kayaking. • Escape from the city life for a day spent outdoors. • Enjoy the night around a bonfire with your fellow campers. A basic level of health and fitness is required to book this camping and kayaking trip to Manchanbele. Travellers with blood pressure problems, heart ailments, spinal problems, respiratory conditions like asthma or any other medical issues are advised to consult with their personal physicians before booking this trip. 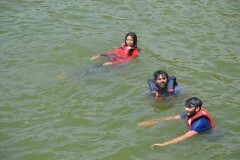 Travellers are required to follow instructions of the camp leader during the camping and kayaking trip to Manchanbele. For cancellations made 24 hrs or more before departure of the camping and kayaking trip to Manchanbele: 90% refund. For cancellations made less than 24 hrs before departure of the camping and kayaking trip to Manchanbele: no refund. You can be picked-up from multiple pick-up points located all across Bangalore. These include: Marathahalli in Kala Mandir by 20:30 hrs, Pizza Hut near the Silk Board bus stop by 21:00 hrs, Udupi Garden bus stop in BTM layout by 21:10 hrs, Banashankari bus stop by 21:30 hrs and Gopalan Arcade in RR Nagar by 21:45 hrs. Day 1 of camping and kayaking at Manchanbele: Travel to campsite and enjoy! Arrive at one of the multiple pick-up points located in Bangalore and settle in for a 2-hr drive to Manchanbele. After arrival at the campsite at Manchanbele, you'll take some time to rest and freshen up. As the evening falls, you'll gather around a peaceful bonfire with your fellow campers and enjoy the night. After a delicious dinner, retreat back to your tents for the night. 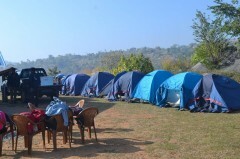 Overnight in tents at Manchanbele campsite. Alpine tents pitched at the riverside campsite. Wake up to a beautiful morning at the campsite. 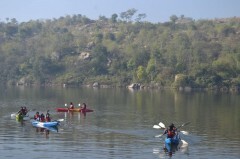 Post breakfast, you'll participate in a fun session of kayaking at the nearby lake. Soon, you'll board the bus and travel back to Bangalore, arriving in the city by 11:00 hrs. Your trip ends here. Go kayaking in the morning. All equipment required for kayaking: paddles, kayaks etc. Personal expenses such as apparel, extra food and beverages etc. All equipment required for camping and kayaking: tents, kayaks, paddles etc. Overnight in tents at Manchanbele campsite. You'll be accommodated in tents at the Manchanbele campsite. Today's meal package includes dinner at the campsite. Today's meal package includes breakfast only. You'll return back to Bangalore by 11:00 hrs. Your trip ends here. The tour operator will arrange your transport the start point of this camping and kayaking trip to Manchanbele.